Jimmy Vesey finally made his long anticipated decision on where he’ll begin his NHL career. The Harvard graduate will be joining friend Kevin Hayes and the New York Rangers. The signing officially ended the Buffalo Sabres hopes of cashing in on a gamble. General Manager Tim Murray took a shot at signing the 23-year-old when he acquired his right from the Nashville Predators for a 2016 third round pick back in June. At the end of the day, it didn’t work out for Murray and the Sabres. However, the risk was worth it and shouldn’t deter Murray from future gambles. When Murray made the move to pick up the impending college free agent he was given no assurances. The trade was a low risk, high reward move for the Sabres. In order to acquire Vesey, Buffalo, had to give up a third round pick. Of course, that pick now ended up netting the Sabres no return on the asset, but it’s important to remember they had four picks in the third round of the 2016 draft. The club was unlikely to make all four selections in that round. Over the last three years, the Sabres have selected 25 players in the NHL draft. An organization can only carry 50 contracts at one time. So, long story short, it didn’t make sense for the Sabres to not flip some of the draft picks. A third round pick usually doesn’t yield a full-time NHL player very often. Instead of waiting on a project player, the Sabres took a shot at acquiring a young player with a first round value at a more experienced age. Murray believed the Sabres had an opportunity to convince Vesey to sign and saw value in getting ahead of the pack to have exclusive rights for nearly two months. BUF GM on trading for Vesey rights: "Why not us? Why not give it a shot? We have a spot in our Top 6 for him. We had four 3rd-round picks." The Sabres roster is still in good shape without the addition of Vesey. As currently constructed Jack Eichel, Sam Reinhart, Ryan O’Reilly, Tyler Ennis, Kyle Okposo and Evander Kane will play top six roles next season. Ennis is a big wildcard to next season in his return from a concussion that cost him almost the entire 2015-16 campaign. Certainly adding Vesey would have been a big upgrade on the wing and provided the Sabres with a deeper roster. Now for Murray and the Sabres the focus shifts to finalizing the roster prior to training camp. A decision needs to be made on whether they’ll look to bring in a player like Jiri Hudler or Brandon Pirri to fill out the roster or rely on their youth to step up. Players like Justin Bailey, William Carrier, Evan Rodrigues and Hudson Fasching will have the opportunity to earn a roster spot in September. Another player who benefits from the Sabres missing out Vesey is veteran Matt Moulson. 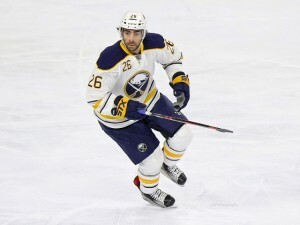 Coming off a terrible season Moulson will have to earn a place in the lineup this season. Moulson will have a better opportunity now to prove that he hasn’t lost it at age 32. We’ll see if the Vesey signing opens up some more dialogue around the league before the beginning of camp. Clubs that lost out on Vesey could swing back around to pull off a last second trade that was discussed earlier this offseason. Also, players like Hudler, Pirri, and Kris Russell could find themselves a new home over the next week. Murray made the right move in trading for Vesey’s rights. He took a risk to bring in a high-end talent for a low-value asset. Murray’s aggressive nature is what makes the Sabres General Manager such a polarizing figure. This gamble didn’t work out, but it doesn’t mean the next one won’t.